“Enter The Dragon“, Bruce Lee’s first (and only) solo big Hollywood production, ran on Australian television last weekend. So it is good timing that I have managed to pull together a video case study of my/SKOP’s “I know Where Bruce Lee Lives“. This tells the story of an ultra-interactive KungFu remixer combining the heroism and cheesiness of 70s KungFu films, the ironic use of the VHS video aesthetic with simple yet engaging interactivity. Here’s more on the making of this interactive art piece. Unfortunately we never filmed any of the live installations and performances. Teaches you to document everything well for cases like these. Many thanks to my former Holler colleague Razif Djamaludin for the animation work. In mid 2000, so almost 11 years ago, I and two other creatives in Germany got invited to create a digital art work for the exhibition Berlin – HongKong. 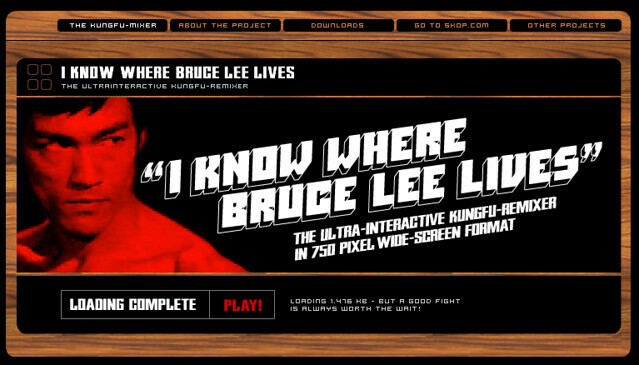 We contributed the most logical thing: an ‘ultra-interactive KungFu Remixer’. We called it “I know where Bruce Lee lives” (a nod to the TV Personalities‘ lyrics of ‘I know where Syd Barrett lives‘). It essentially was a very early mash-up piece, using snippets of Bruce Lee films (animations, fight sounds and loops of the score by genius Lalo Schifrin). Particularly entertaining for us was the hammy gangster dialogue snatched from the German dubbing of said martial arts films. Sprinkled into the mash-up were Chinese characters that mimic some of the sounds you hear. In order to get these right we had asked a Chinese language professor for help – to this day I have no idea what they really mean (see a trailer for the app here). The playful interactivity comes through using your keyboard to ‘make music’ with Kung Fu. There is a longer list of the international festivals and exhibitions (from the US, Brazil, Spain and Holland to Hongkong and Australia) it was part of. To this day ‘I know where Bruce Lee lives‘ ranks among the top Google search hits for the Asian hero. I still receive emails of people discovering and liking it, among them many martial arts fans but also musicians such as Krautrock-god Holger Czukay of CAN fame. The latest feedback email came through last week, from one of the members of ‘V for Volume‘. They are apparently a very popular Chilean band, coincidentally sporting some half-German members in their line up. It is kind of hard to see the Bruce Lee connection in this video, maybe I should brush up on my Spanglish. But despite this, it never ceases to amaze me how the internet connects us in different ways at different times with our various tastes and aesthetic sensibilities. Double Rainbow all the way. Electronic Entertainment on a world-level! When you rummage through your own past creative work, you occasionally stumble upon something you had forgotten about, yet a piece that still holds some powerful memories. And I mean powerful memories beyond “Oh, that client was a nightmare” or “Remember tracing outlines in those 250 frames?”. This piece was done as a promotion of our experimental design studio skop, as part of the KungFaux DVDs. I wonder if people that are younger than 30 years and not from East Germany would find the language of the voice over funny. I don’t mean German itself (a hilarious language, I know!) but the style of the official GDR government language. At their time of glory, it was exactly like that. All their economic, technological or cultural achievements were “auf Weltniveau” (“on world-level”). 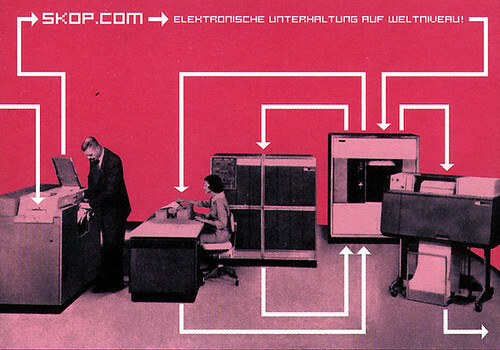 So we thought Skop (being Berlin-based and with 50% of their workers drafted from the former Eastern part) should be delivering “elektronische Unterhaltung auf Weltniveau”. Somehow the clunky pompousness of the German words don’t translate too well into English: “electronic entertainment on world-level” might actually be EA‘s new tag line. Anyway, I still see my comrade Peter standing in the toilet of our studio, hunched over the in-built microphone of his Powerbook, in order to make the sound extra dodgy. Very little post-production I must confess. 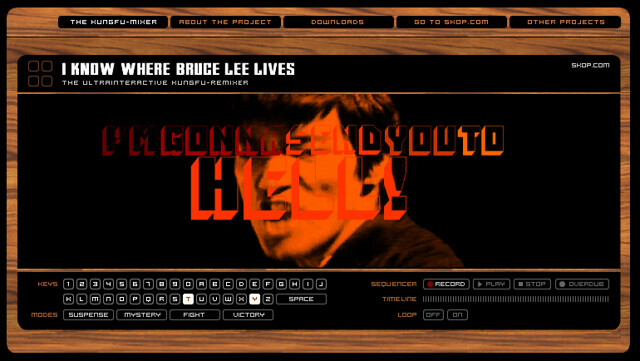 The KungFaux producer Mike Neumann got in touch with us after we had done the “I know where Bruce Lee Lives” remixer. Subsequently I interviewed him on a podcast for Neue Digitale. We also did a short promo movie about said remixer, again for the DVDs, summing up the KungFu mayhem in motion. KungFaux itself was an early mash-up of game style graphics, urban music and trash-talk dubbing of martial arts movies. I think I might have caught a repeat on ABC2 and on some cable channel here in Australia. Some of the slang being used by the featured rap artists in them is quite beyond me, we really should have done a translate-the-trailer back then. We could have beaten Host by at least 4 years! !